Spring Sponge – The Spring Sponge is a totally new sponge Butterfly created. The most notable feature is a sense of holding balls, which belongs to a different category to any other existing rubbers.Spring Sponge was realized by the exquisite material composition and air inside; it holds and pushes balls with expansion and contraction like a spring, allowing you to control spin, speed and direction of the ball at will. 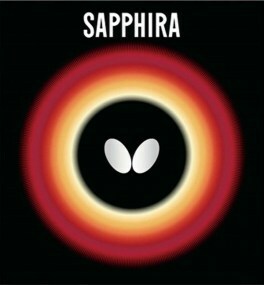 High Tension - High Tension by Butterfly is an innovative technology developed through passion. We use this technology to produce rubbers of a new generation that guarantee unbelievable grip, extremely good feeling and high resistance that will lead dynamic and rewarding play. 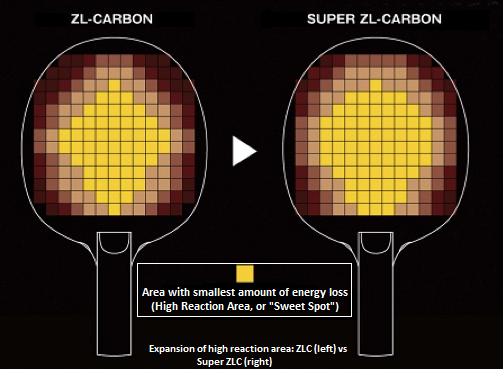 Super ZLC - Super ZLC is Butterfly's latest and greatest technology, having 1.8 times as much densely woven Carbon-Fibers and ZL Fibers in mass as the previously released ZL Carbon models. By adjusting the proportion of each material, Butterfly has suceeded in gaining a very high reaction performance to expand the high-reaction area with the Super ZLC. Arylate - Vectran Fiber displays great initial vibration when compared with other materials and very rapidly absorbs the vibration.The big amplitude of Vectran Fiber at first period makes the racket very flexible and offers more spin. Arylate/Carbon - Arylate-Carbon blade is made by the hybrid technology used by Vectran fiber and Carbon. Carbon offers high speed and excellent stability, arylate a very good elasticity. ZL Fiber – ZL Fiber is a brilliant PBO fiber (Poly-p-Phenylene benzobisoxazole fiber) with an adamant molecular configuration that has summit level tensile strength and elasticity. In addition, as its ratio is 10 percent lower than carbon fiber, high performance blades can be made lighter with it. It is ZL-Fiber, a great fiber that brings a blade high performance. 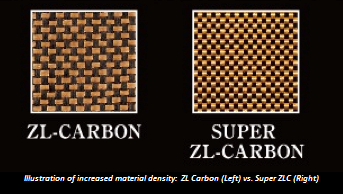 ZL Carbon – ZL Carbon joined the trend of a new special material: Carbon, Arylate, Arylate, Arylate-Carbon, and ZL Fiber.This is a combined weaving of Carbon and ZL Fiber.Carbon has high repulsion force and ZL Fiber has strength, impetus and lightness at the highest level. TAMCA U.L.C. - Uniaxial Light Carbon – TAMCA-ULC is a carbon sheet with a totally new capability.While fibers are weaved evenly in every direction for existing Carbon sheet, a lot of carbon fibers are applied only lengthwise for TAMCA-ULC, which causes an effect on the ball speed.This way of weaving materials we realized the further weight saving without lowering the speed. Tamca 5000 - Butterfly Carbon blades have been continuously improved and include control capacity with very high speed performance. For the uncompromising offensive player TAMCA 5000 is the ideal choice.